The right accessory or piece of jewellery can really make (or break!) an outfit but that doesn’t mean it has to make a big and bold statement. More often than not, especially for everyday wear, it’s the subtle pieces which can finish your look effortlessly and work with every if not nearly every outfit. Sentimental, fun, motivational; jewellery can be all these things and more. And so very personal. On this one hand (pictured below) there’s motherhood, life goals, loss and career represented to me but from a purely aesthetic point of view the pieces I wear daily are simple enough to add just a little something to my outfit for a polished finish without making a statement. 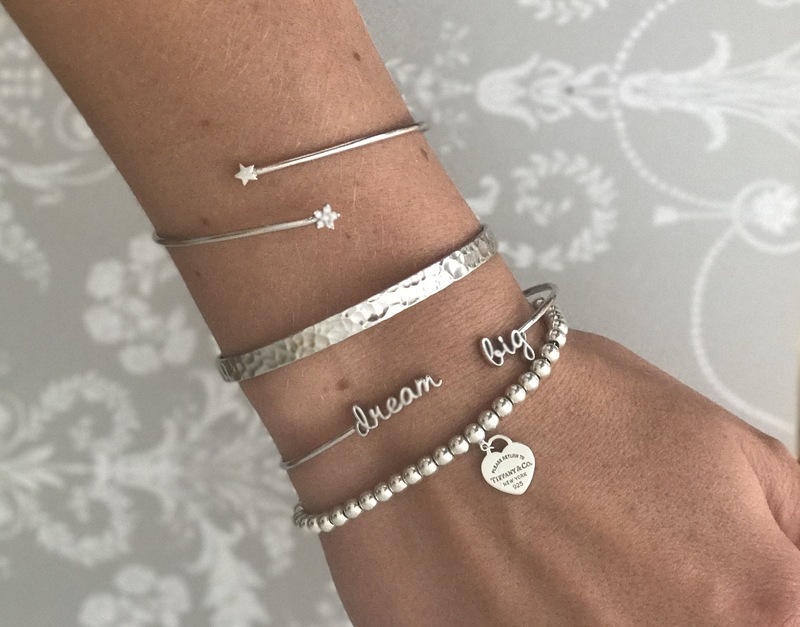 Tiny star cuff, Dose of Rose | Personalised hammered bangle, c/o Merci Maman | Dream Big bangle, c/o Scream Pretty | Return to Tiffany bracelet, Tiffany & Co. Mix and match textures within your everyday jewellery. I try to create a balance with a variety of different finishes, widths, weights of metal. 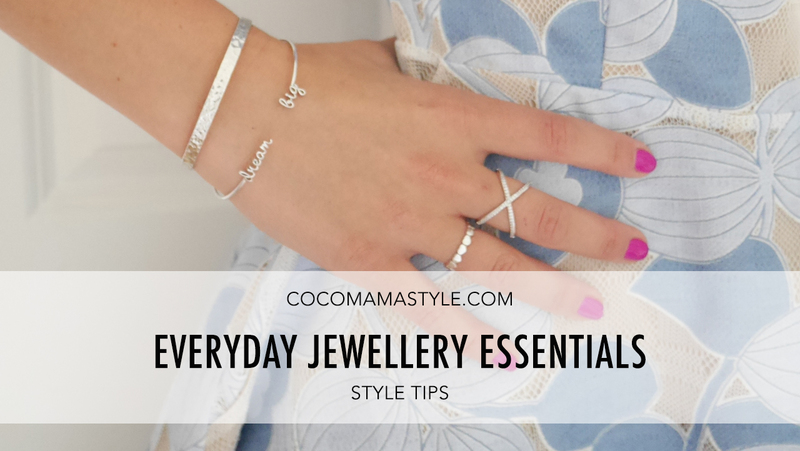 Layer up to create your own combinations and discover new and niche jewellery brands to explore via Notonthehighstreet and Etsy – as well as right here on cocomamastyle.com too of course! Choose pieces which complement, not overpower, your fine jewellery and sentimental pieces. I tend to stick to just my stainless steel Apple watch on my left side with my slim wedding and engagement rings and balance with 1-2 rings and 3-5 stacked bracelets on my right. Don’t be afraid to mix metals; I tend to stick to silver with the odd gold or rose gold piece just because I’m always drawn to silver coloured jewellery but it’s definitely not a fashion faux pas to mix it up and adds further interest when you’re varying textures too. Make it personal. In discussion with the fashion legend that is Hilary Alexander while at British Style Collective recently, she said she often chooses her jewellery before the rest of her outfit and favours tribal style natural jewellery from her travels. So while I’m offering tips based around my personal everyday jewellery style, these pieces are right for me, my style and my personality but yours may have a more boho, gold, or colourful feel. That ring on your middle finger is totally unique and very beautiful.